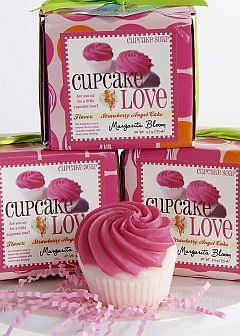 Margarita Bloom strawberry Angel food cupcake soap, specially formulated for cupcake lovers without the calories. Soap is the size of an actual cupcake and comes topped with swirled pink frosting and sprinkles. We just love the edible smell and pink and green packaging. Perfect for gift baskets, goodie bags or guest bathrooms. * Size 4.5 oz soap. * Directions: Lather between hands to smell yummy delicious!